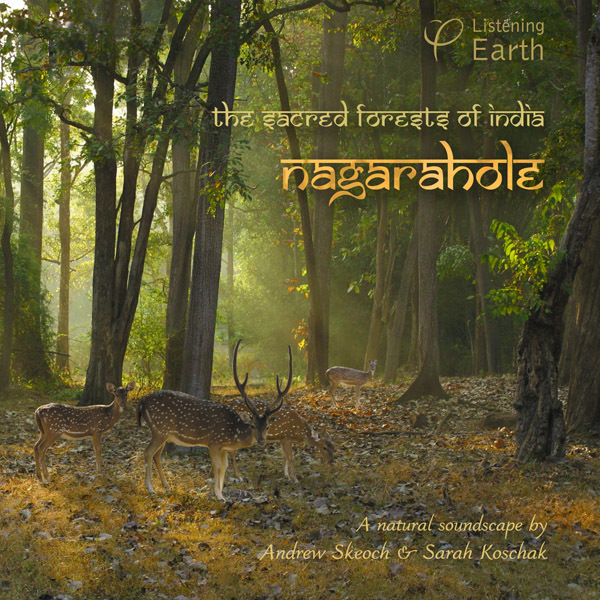 Nagarhole forest has been described as 'The Jewel in the Crown' of India's national parks. Located in the verdant hills of the Western Ghats, the park is part of the Nilgiri Biosphere Reserve. 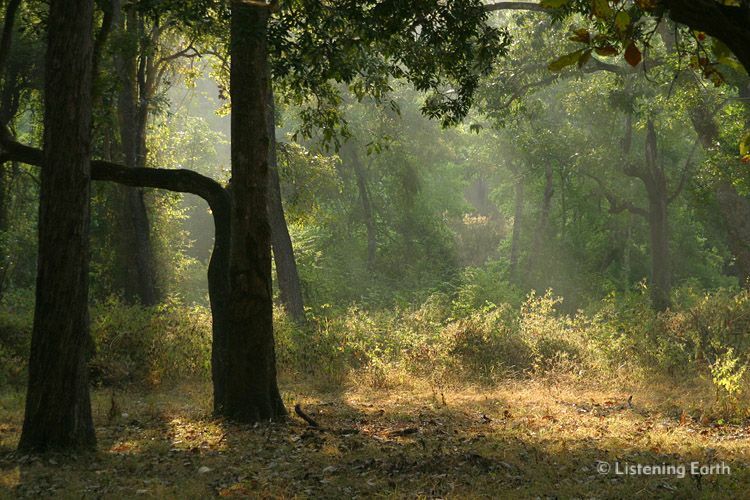 Here, in deep forests of teak, rosewood and bamboo, can be heard a wealth of India's wonderful wildlife. The dawn begins with swelling birdsong; Whistling Thrushes, Parakeets, Flowerpeckers, Mynahs, Jungle Fowl and Drongos all join a fabulously varied chorus. Sambar Deer and Langur Monkeys give resonating calls, and in the far distance, the source of their displeasure is revealed in the huge roars of a pair of Bengal Tigers. Later we hear the tonal songs of Scimitar Babblers amongst a bamboo grove that rustles in a gentle breeze. A family of elephants pass through, swishing noisily through the dry grasses and communicating in low rumbles. As dusk falls, Coucals and Barbets call by a waterhole, along with the first of the evening's frog chorus. We conclude with a pair of Brown Hawk Owls heard in the jungle night. 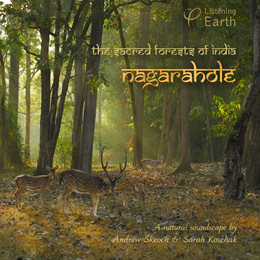 "This recording was made in 2002, during our first field trip to India. At the time we received the support of the Indian Forest Dept, and were even allowed into the park's core area to record. More recently we've heard from our friends in India that changing policies have severely limited access to the park, and that if we visited now, we would not be allowed into the areas where these recordings were made. So we feel this is a very fortuitous record of a special place, and hope that ongoing discussion about policies in Project Tiger reserves achieve the aim of enhancing protection." Our original recordings for this album contained many small imperfections, due to a combination of circumstances under which we had to do our field work. At the time we first prepared the album, I cleaned up those minor flaws as best I could. Now, over a decade later, we have returned to our source recordings with new generation technology, and worked some digital magic on them. We were also limited by the playing time of a CD. With downloadable files, that is no longer a creative constraint. This edition presents the complete recordings, unedited, so you hear events unfold naturally. If you have purchased this album previously, this remastered version will replace the download product in your order history. If you purchased this album prior to our new shop, please contact us. The CD version of this album remains the original edit, and includes a 12 page booklet.